If you’re looking for a great way to jazz up plain dal, look no further- this one definitely hits the spot. If you're like me and always have cooked dal on hand, this dish comes together very quickly. 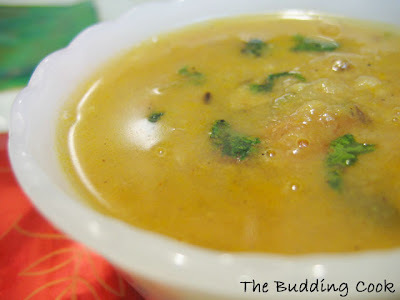 I’ve been making dal fry very frequently since I first saw this recipe on Sanjeev Kapoor’s site. This is a refreshing change from my usual dal preparations. Stir in the spice powders (chilli, amchur & pepper). Cover and cook till the tomatoes become mushy. Add the dal, mix well with the other ingredients and cook. Add desired amounts of water depending on the final consistency desired. Bring to a boil. Garnish with coriander leaves and add a good squeeze of lemon or lime juice after turning off the heat. Serve hot.